Michael Ubaldini has led what is often described as a ‘colourful life,’ one that has given him plenty of material for his beautifully written, strongly poetic songs. He is in fact often known as ‘the rock ‘n’ roll poet,’ and not without very good reason! His book ‘Lost American Nights,’ which comprises his lyrics and poems is now into it’s second edition and actually used one of my quotes about his previous album as part of it’s publicity! In his songs he blends classic rock ‘n’ roll, country and blues without ever really smoothing off the boundaries, and as many do, converting it to the all encompassing ‘alt. country.’ He sticks with the particular genre that he envisages the song fits in to, relying on his excellent warm, vocals, and the sheer quality of his writing to avoid any disjointedness in the flow of the album, something he succeeds brilliantly in. The tempos are varied, as is the subject matter and the emotional content, with the pleasant warmth and expression of his vocals being perfectly suited to the songs he writes, in fact a friend recently compared his voice to Rick Nelson’s. 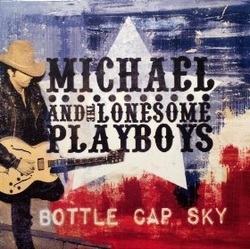 There might be a vague similarity, but Michael has a much less polished edge than the late country rock forfather, perhaps a blend of him and Jason Ringenberg at times. On this album Michael takes all lead vocals, lead guitar, blues harmonica and acoustic guitar, with Rob King on bass guitar, Gary Brandin, pedal steel and dobro, Jeremy Long on piano, Candy Girard on fiddle, with several different drummers being used. All songs are written and arranged by Michael Ubaldini who also produced the album. I get the impression that whilst most of his songs have at least their roots in country music he doesn’t actually set out to write a country song, more a case of just writing his poetic lyrics and adding music that he feels will suit, removing any stylistic contrivance and blending several styles, with country as it’s foundation, into his own individual and varied sound. country ballad that includes some lovely steel guitar on a tale of loneliness and doubt when his lover has to go away, whilst Someone Should Put You On Trial is a dark blues with atmospheric harmonica and chugging guitars. The Outlaw Kind has a country steel guitar intro followed by a chugging rock ‘n’ roll guitar on a mid tempo story song about a young man who try as he might just can’t seem to avoid trouble! Final song to get a mention from this album where everything is of a similar, extraordinarily high quality is Heart Full Of Tears. It includes steel guitar and piano on a slow moody tearjerking story of heartbreak that easily fits under the ‘classic country’ umbrella although the lyrics are more powerful than most. Michael Ubaldini is one of the few singer songwriters that even if he is unknown to you, you can go and buy any album he has ever released and know that you will get outstanding songs, diversity of styles, tempos and emotions and excellent vocals, arrangements and playing. Qualatively, he has been incredibly consistent throughout his career, but I do think this album improves slightly on what has gone before!